We have helped in the planning of over 200,000 bachelorettes parties, and are very confident we can help you shop for the right bachelorette party supplies to make it a success. Whether you are going out on the town or staying in, whether you are having a classy or sassy party, having the right bachelorette party supplies, decorations and favors will contribute to a memorable last night out event! Good Rule of Thumb - Make sure to plan early and order your supplies with lots of time to spare. Our site offers some of the lowest prices on bachelorette favors decorations, candy and so much more. When planning early you can get the best rates on standard shipping and we even have a free shipping option for many orders. By ordering early, you have plenty of time to both shop and get the goodies so that time can be spent planning the bachelorette party and not worrying about the decorations arriving in time! Pin the Macho on the Man has been a favorite for years and makes for a great bachelorette party decoration as well as a game. Just like the pin the tail on the donkey, this game uses various cartoon cut out penises to pin on the hunk. Blindfold the girls and spin them to see if they can place the hilarious willies as close to 'anatomically correct' as possible. Game seems to get even more fun when a few drinks are down. 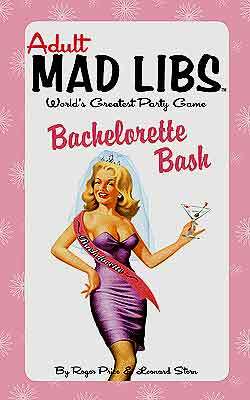 Another one of those crazy fun bachelorette party games that is similar to the games we played as kids is the Bachelorette Party Mad Libs. iNot quite a fill-in game we played as kids with the funny twist when you fill in the black Nouns, Adjectives, Verbs, etc. Again just like most of the games, this can be played just about anywhere, and try playing it at the beginning of the night, before the Bachelorette Party has started hitting up some of those drinks, then replay those same ones, and see how much the answers change!! Below we have listed some of the most popular items as well as some ideas to think about when planning which supplies you want for personalizing your own party. When thinking of supplies, they fall into a few categories that we have listed below. Each of them help in fulfilling different parts of the last night out with us only showing the top ideas and the most popular items - based on our customers and experience over the years. One of the most popular products is what to dress the bachelorette in. A great place to start is her preference as to whether she wants a classy or sassy last night out. Some of the most popular items are a bachelorette tiara which come in so many colors and sizes. Many of them have words like “Bride to Be” or “Bachelorette” across them and can sparkle and even flash. We have a wide selection for you to choose from along with an excellent bachelorette party Bachelorette Party Princess Pack offering all you need to dress up the bachelorette for a very low price! 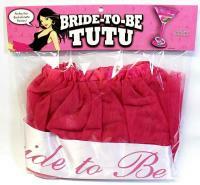 There are many other supplies to dress up the bachelorette in, including a bachelorette party sash. You can find those sashes that are classy as well as fun bachelorette sashes that light up! This wearable is excellent to dress up the bride-to-be in which gets a lot of attention if you are out on the town as well as making the bachelorette look like a pageant winner. Another really cute item is the inflatable ball and chain which is cute and really ads some fun to whatever the bride-to-be is wearing! There are a lot more ideas throughout our site as well as great themes for all the other bachelorettes to wear and participate in. The Fancy Pecker Crown w/ Veil is another one of those cute bachelorette party 'dress me up's" that makes sure to get the Bride to Be noticed and some attention!! At a distance it just looks like a cute pinkish crown with a veil, but as it gets closer the top of crown has jumbo sized diamond shaped clear stones with some pink peckers next to them, and then attached to the veil ae pink penises down the trail, its both cute and a 'double take' - definitely are great way to make sure she gets some free drinks on the night!!! Ok, when we first saw this one, well we thought to ourselves, Really?? But if you are looking to make sure the Bride to Be really 'stands out in a crowd' well the Bride to Be Tutu - Bachelorette Party suppy just might be your ticket!! Yes it really is a Hot Pink Bride to Be Tutu in all of its glory!! All pink lace with a super nice Bride to Be sash that is attached to it stating 'Bride to Be' so that there is no mistaking who is the guest of honor at this Shin-Dig!! Give the room a make-over with some cute decorations around the area you are throwing the last night out. There are tons of bachelorette party decorations including banners, wall hangings, centerpieces, balloons and more. Sprinkle some bachelorette confetti on the table and use a Bachelorette Party Trivia Tablecloth which is festive and fun as it has a game to play – including markers. Dress the room up anyway you please but make sure to think about the venue, weather (indoors or out) and the bride-to-be’s preferences when planning what you will be decorating. 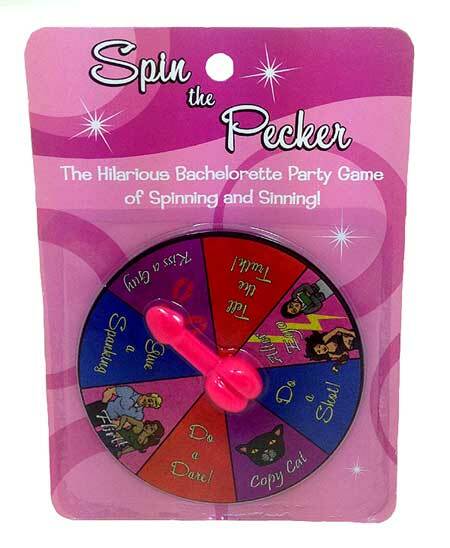 Spin the Pecker is a very mobile game that you can take anywhere. When going out with the bachelorettes, throw in a purse and take it out at any time to take turns in seeing who will do a shot or flirt. Play for points and on teams. A lot of fun with a group of girls. Take a look throughout our site at other games we offer since you will find all of them at great prices and a wide selection to choose from. We also have our Free downloadable Bachelorette Scavenger Hunt Game which you can play with the girls and has 100 dare items! We always try to bring as much bachelorette party supply information to you in helping create the party that is right for you and your friends. A bachelorette party supply that we loved, but they have since unfortunately discontinued was the Picture It game. Just like the classic Pictionary game, this is one of the finest games. The cute box contains 75 cards of bachelorette and bridesmaid themed items along with a pad of paper, sand timer and pencil. The girls will break into teams as one of their teammates chooses a card and draws the wedding related item, as the other girls guess what the girl is drawing, without her saying a word to her teammates until they get it right. Make it more fun and have her do a shot or dare if she uses non-verbal expressions as head nods, hand movements, etc. Bachelorettes need to guess the clues drawn on a piece of paper to correctly identify the final word produced by each themed card. By doing so, the team guessing correctly will gain points. The first team to reach 15 points will win the bachelorette party game. Every correctly guessed themed bachelorette word is equal to one (1) point. We think in searching out bachelorette party supplies some are just fun to do yourself and make it current and relevant, so try this Picture It game yourself! Call all the girls (or at least the ones wanting to be involved) and brainstorm on great Pictionary type challenges, you can make them as naughty or nice as you want, then just pick up a sand timer or you can just as easily download a timer for your phone and you have your homemade version!! We carry a vast array of more formal boxed & packaged bachelorette party games, which are still small enough to fit in a larger purse and easy to carry! No matter where you go, we always suggest a few games you can whip out for the evening, it's a great group motivator and seems to kick things up a notch and always makes a nice ice breaker for the girls who might not know each other, check out all the great 'ready to go' discounted Bachelorette Party Games!! 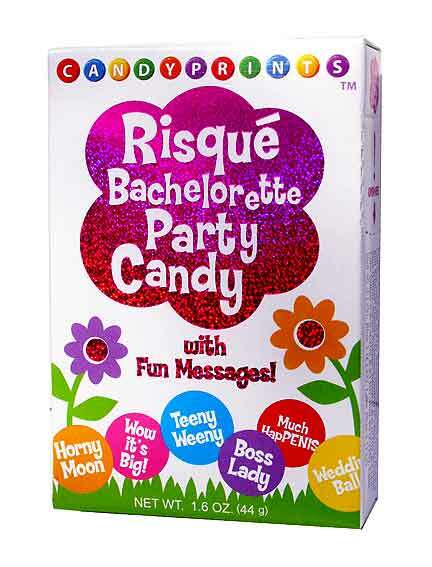 Bring in the sweetness with our largest selection of bachelorette party candy found on the net! The candy comes in rings, necklaces, bracelets and candy you can place in trays and on tables. Many of them are shaped as diamond rings or willies. Get one for each girl in a bachelorette gift bag that they can take with them when going out on the town or even at a home party. One of the free items we give in orders is a bachelorette party candy since everyone loves some sweets! Depending on what type of party you are having will determine what type of utensils you may need. 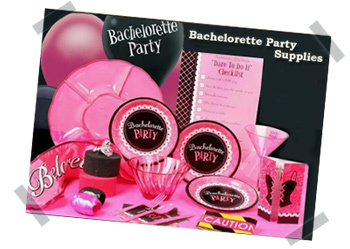 We have tons of bachelorette party supplies for tableware that includes cups, napkins, plates, plastic-ware, trays. Some of the more favorite items are the bachelorette sippers and Cocktail shakers. You can make it easy and get an all in one party pack which will include everything you need for a table. Makes it really easy to make for a festive last night out without the thinking of what to order – all at a great discounted price! Nothing says party better than a chaperone in the form of a bachelorette party blow up doll. Fun inflatable’s make for a great and memorable time since you can dress the blow up doll as the bride-to-be’s fiancé, favorite celebrity or favorite rock star. Give him a bachelorette name tag and watch the heads turn as the bride-to-be passes by them handcuffed to her inflatable boyfriend for the evening. There are some great games as inflatable’s which you can find throughout the games pages. Make sure to get lots of pictures which make the party remembered for all your friends who are attending. A great idea is to take pictures with your phone and email them to those who could not make it, including the groom, showing who the bride-to-be hooked up with. You will get great laughs from all. It is always nice to give the girls who attend a little gift bag to start the nights festivities. Our favorites are found on our Favors page and include things like the peep show camera, shot glass wedding ring, and candy whistle necklaces. A fun and creative idea is to get a bachelorette bag and fill them up with these little items which will be appreciated by all who attend. It also starts the event off with some little gifts which will amp the girls in looking forward to a great time during the last night out. There are many other bachelorette party supplies you will find throughout out site – at the lowest prices around. We appreciate you in taking the time to get ideas from our site and hope we offered you what you were looking for. We are always around to answer questions and can help in preferences on what the bride-to-be may want. Call or email us as we are here to make your last night out party one to remember. Is the bachelorette sassy or classy - conservative or wild? Does your bride-to-be get embarrassed easily? Does the bachelorette like certain items that can be turned into themes? Does your bride-to-be like attention drawn to her or more of a personable quite person? Answering these questions will help in you planning which supplies are best for the festivities. Where is the bachelorette party being held? Is it home or away? This will determine if you purchase bachelorette party supplies that are easy to travel with (smaller items that fit in a purse or suitcase) or go with big, bright and bold for home party decorations. Will the supplies be used indoors or outdoors? In the summer months, it is fun to get supplies that squirt water and can be tossed around while in the cold months, the supplies will most likely be used more indoors. The earlier the better - Ordering your supplies as early as possible will help save in shipping (maybe even free freight) and allow time for you to choose the best bachelorette party decorations available. It is like making a list when going to the supermarket - you many times will save and be more economical with some planning. We always suggest at least three weeks early to order but it is absolutely fine and usually doable with one week left - even though rushed. Bachelorette Brain Session - Call an early conference call or coffee shop meeting together to first meet all the bachelorettes that want to participate in planning the bachelorette party supplies and venue as well as help in the "where and when". This is a great ice breaker, collection of emails and names with faces as well as where the fun and excitement begins. Let everyone give their two cents worth with first discussing who the bachelorette is as discussed above. Where are the games? 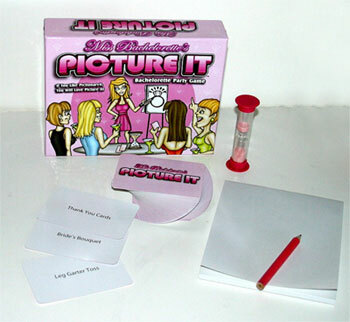 One of the most popular supply categories is bachelorette party games. There are so many fun ones to play and bring wherever the party takes you. Whether you are going to play dare games, drinking games or more conservative sentimental ones, they always contribute some great memories with the girls. One of our favorites is to go around and discuss how each of you met the bachelorette and one funny thing she has done. Some of the bachelorette party supplies are both games and decorations so you get a two-in-one! Look through our site and you will find under the games lipstick button on the left some of the funniest bachelorette party supplies that are out as well as brand new items of 2016-2017. Saving money by throwing a mixer - If the economy has hit you hard and you and the bachelorettes have little money to spend, decide on your budget as a group and only spend what is necessary for party. The rest can be created with some good old fashioned pens, paper and scissors. Have some fun with a pre-decoration party where you and the girls can make some of the cute supplies. The bride-to-be will be touched with the thought that goes into the creativity that some of the girls may want to show! Most important - it is all about having fun with your friend or family member who is about to take the plunge so dress up the party with some exciting bachelorette party supplies she will remember and appreciate. We would love to hear your ideas on what bachelorette party supplies made your party memorable so we can post them for others to enjoy. Email us at Orders@BachelorettePartyFun.com. We look forward to hearing from you and will only use your first name and last initial if you allow us to. A bachelorette party celebration has traditionally been symbolized with many types of supplies and favors along with some really fun last night out venues and games. One of the most popular items is the Pin the Macho On The Man. Just like the child's game Pin the Tail on the Donkey, this game is the adult version that includes a poster of a good looking guy, in all of his glory, with a bulls eye covering his privates! The game comes with cute cutouts of different cartoon willies with different sizes and shapes that you can cut out and use as game pieces. All in hilarious shapes, sizes and graphics. Just like in the traditional game, each girl will be given a cut out willie, blindfolded (make sure to bring a sash or scarf with you so you can blindfold the bachelorettes) and then they are spun a few times, then directed towards the Pin the Macho poster find her target. Its a good idea to bring double sided tape or tape rolled in a circle so you can stick up the poster. This is one of those bachelorette party supplies that really works throughout the last night out as it can be used as a game and bachelorette party decoration - take it out to a bar or club, it is always a good time to see the reactions when this is played live at an event! The poster makes a great memento for the party too, whether you are out of town or at a home festivity, at the end of the event, have all the girls sign it with their best wishes for a Bride to Be momento. Pin the Macho on the Man has been a favorite game for bachelorettes for as many years as we can remember, so it comes highly recommended!! 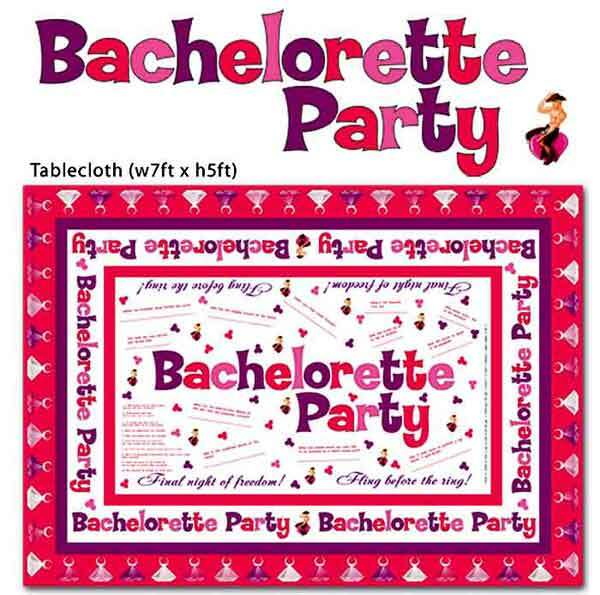 This popular bachelorette party game has stood the test of time as one of the best in bachelorette party supplies. The game seems pretty straight forward, but there are so many twists you can add, making this childhood game, not so childish!! Make the Pin the Macho on the Man a girls night out drinking game by adding rules - maybe the one who comes closest to pinning on the 'Shmeckel' gets to call who drinks, or make it each round the one at the bachelorette party who pins the "dong' the furthest away has to drink. You can also make up a game with the Pin the Macho by having everyone write dares on the willies and the closest 3 girls to the target get to choose who will do the dares they wrote on the game piece. We have tons of dares you can find for free at our Scavenger Hunt page. Check out our other Bachelorette Party Supplies which will give you other great ideas and have a ball at your bachelorette bash! Kiss a Guy - This would of course mean to have a girl find a guy to kiss. What makes the game more funny is to come up with different characteristics of a guy that she needs to find (i.e., bald, red hair, rock star looking, nerd). Have some fun with it. Tell the Truth! - Just like the classic game of truth or dare, have someone ask her an intimate question and let's see how the bachelorette answers. Do a Shot - Have a guy or one of the girls purchase a shot for her to down. If she does not drink, make it a virgin version of the drink. Give a Spanking - Have her find a guy or girl to give a spanking to. Make it fun and dramatic. Copy Cat - Have two girls go out (get one of your crazy bachelorettes) and have the girl who spun this to copy what she is doing. You can also play this like having the girl imitate someone at the bar or restaurant you are at for 2 minutes. Do a Dare - Easy enough; come up with some of our favorite bachelorette party dares prior and then choose from the list you have. You can also use our list we have here. Alter Ego - Do something wild or mild, depending on whatever the opposite of your personality is. Live like a rock star, catholic school girl or dancer - whatever is opposite of you and have fun with it.